Taste test: These tortilla chips were very large, with a quarter-circle shape. Generally, they did not have much curve to them, which is not hood dipping purposes, but they were large enough that you could still probably hold a good amount of dip. But there was really no need to dip them, since they were coated with a very tasty seasoning. Our tasters really enjoyed the taste. The chips were a little less crisp than would have been ideal, but still, there were very good chips. Smell test: Very nice tangy smell, kind of like salsa. 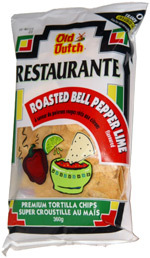 Not sure if I could smell lime or bell peppers, though.